Anne's older sister Martha had been betrothed to a man named Thomas Kyme and their marriage was being arranged with much haste. It made sense, by Sir William Askew's judgment, to marry off Martha to Thomas because he was a successful businessman. Thomas promised to take the care of Martha off of his hands and William was eager to gain the influence that such an arranged marriage might afford him. After all, he had become a successful businessman himself by such shrewd and calculated analyses. But Martha died unexpectedly and the plan was stalled as her death was mourned by the families. But the death of one daughter was not enough to annul the promise in the eyes of either William or Thomas. After all, it had never actually been about Martha but, instead, had always been about the negotiation of power and influence. So, Anne made a perfectly sufficient substitute in the eyes of her father and soon-to-be-husband. She was married to the man against her will by ministers who had strayed from their high calling and were willing to overlook something like the bride's resistance. She refused to call herself or answer to the name of either Anne Kyme or Mrs. Thomas Kyme. With the help of priests who were willing to abandon the faith for expediency, Thomas was able to manipulate and rule over his unwilling bride for years. Eventually Anne began to understand herself as the wife of Thomas Kyme and she bore two children to him even as she still refused to take his name as her own. She began to seek a divorce on the grounds that she could not believe that any man who would force marriage upon her and any priests who would be a part of such an act could have any part of the Kingdom of God. So, since Anne considered herself a Christian she thought herself to be unequally yoked with Thomas and insisted that this was reason enough for a divorce in a nation where Henry VIII had found divorce for far worse reasons. Soon she was traveling abroad, spreading the Gospel, and campaigning for the reform of the Church that had allowed such injustices to be perpetrated against her. She was not an opponent of the Church--she was an opponent of the Church's broken and unwilling insistence that all it did was consecrated and the work of God. She needed an apology and they needed to give one. For these reforming activities and her refusal to be quiet even though she was "just a woman" she was arrested and threatened with torture. While she sat in the tower of London the king's men devised a plan to reveal more reformers within the ranks of the elite and influential. They decided that torture would loosen Anne's lips and so Henry VIII appointed Anthony Kingston to stretch her upon the rack until she revealed the names of others who opposed the king's brand of savage faith in power and influence. Anthony hesitated because she was a woman and was released from the task. Instead, it was given over to Thomas Wriothesley and Richard Rich. They did their best to execute the king's worst and Anne was viciously tortured in the tower of London. She refused to name any names but repeatedly insisted that she was willing to suffer for her Lord Jesus. This only infuriated the men because they claimed Jesus as their own even as they tortured and abused the woman--they missed the irony of this dark joke perhaps because they were so thoroughly invested in drastically broken values. She was stretched taut half-a-foot over the rack and her tendons, bones, ligaments, and muscles were broken and disfigured. When she still refused to do what they asked she was condemned to death and the condemnation was blessed by the same type of ministers who had erred so colossally before. They had to carry her to the stake where they burned her because the rack had left her unable to walk. When she arrived, they seated her on a post attached to the stake that would be her last earthly support. They covered her in gunpowder, set the stake ablaze, and foolishly prayed that God would have mercy on her soul while she prayed that God would forgive them for their sins against her. 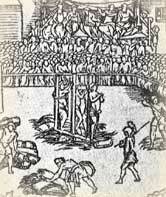 On that day in July of 1546, they made a martyr of Anne Askew and sinners of themselves.